This essay is part of a series in which Poetry Northwest partners with Seattle Arts & Lectures to present reflections on visiting writers from the SAL Poetry Series. 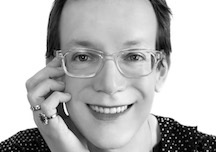 Steph Burt reads at 7:30 p.m. on Monday, October 9 at McCaw Hall. 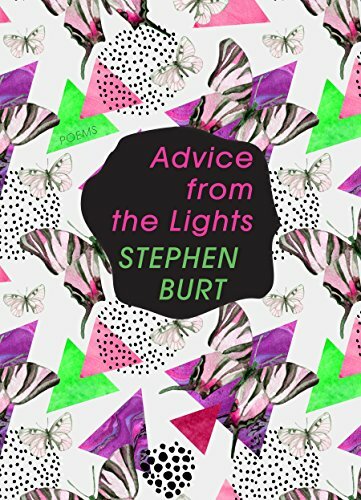 In Advice from the Lights, Steph Burt’s new poetry collection (Graywolf, 2017), we hear from a variety of unlikely speakers: a hermit crab, a betta fish, a roly-poly bug, a herring gull, a water strider, a pair of ferrets, a secondhand flashlight, white lobelia flowers, kites, the Egyptian god Anubis, and even a “Fuzzy Golem Doll with 6” Keychain” at a Prague synagogue. The ferrets, in captivity, make circular arguments into circular shapes. And white lobelia hangs out, or hangs, in the garden store, gossiping with the petunias. Personification plays an active role in Advice from the Lights, starting with the first poem, where a chunk of ice tells us, “I grew up in the human world,” and immediately becomes human, or feels human, or humanly. There is humor in these poems; pathos, insight, and charm; rhyme with and without reason; a sense of place and a place for sense. There is order, but also, at times, a slipperiness to the “I” that opens into a doubling of character and intent. to a lateral move at low velocity. myself, or tries to tell me what my name should be? Here Stephanie may be speaking for herself, and she may be speaking of that place between childhood and whatever comes next, but she may also be speaking of the other Stephanie, the one who writes, in “My 1983,” of giving “ten-minute lunchtime lectures // about linguistics to playground structures.” The advice this Stephanie, or “Steve,” receives from a favorite teacher is to think “about what might be interesting to your friends, / not just about what’s interesting to you.” What do we make of this? We can fathom the reasons. But there’s more to learn—“Advice for Holding Together” tells the reader: “Become your own / indignity.” Is Burt holding childhood together, or breaking it apart? Thepe+the same as the ones who put me down. The double meanings of “pick me up” and “put me down” subtly invoke that awful claustrophobia of youth, but also its vulnerability and wisdom. Perhaps this is the answer to adulthood. In “My 1982,” Burt writes, “I had a future in the dark,” and this is a future, not just of playing a Putt-Putt miniature golf course where you have to hit the ball through a windmill that blocks you if your timing is incorrect—a metaphor for childhood if there ever was one. This is a future, not just of “a wish to look as if I were watching the stars,” but a future of watching from the stars. What greater lights could there be? how to live in this world. Mattilda Bernstein Sycamore (www.mattildabernsteinsycamore.com) is the author of a memoir and two novels, and the editor of five nonfiction anthologies. Her most recent title, The End of San Francisco, won a Lambda Literary Award. Sycamore hosts Contagious Exchanges: Queer Writers in Conversation, a reading series at Hugo House that will resume in 2018.